Life has spent the past few billion years working with a narrow vocabulary. Now researchers have broken those rules, adding extra letters to biology’s limited lexicon. Chemist Floyd Romesberg of the Scripps Research Institute in La Jolla, California, and his colleagues manipulated Escherichia coli bacterial cells to incorporate two types of foreign chemical bases, or letters, into their DNA. The cells then used that information to insert unnatural amino acids into a fluorescent protein1. Organisms naturally encode heritable information using just four bases: adenine (A), thymine (T), cytosine (C) and guanine (G). These form pairs that hold together DNA’s double helix, and different three-letter sequences code for each of the 20 amino acids that make up the proteins in living cells. The new work is the first to show that unnatural bases can be used to make proteins within a living cell. Several teams are attempting to expand the genetic code. The four natural DNA bases can be arranged in 64 different three-letter combinations, called codons, that specify amino acids. But redundancy in this code — for instance, CGC, CGA, CGG and CGT all stand for the amino acid arginine — means that nearly all proteins needed for life are made of just 20 amino acids. Researchers including geneticist George Church of Harvard Medical School in Boston, Massachusetts, are working on repurposing redundant codons to specify new amino acids. Romesberg’s group is exploring a different strategy: adding an entirely new base pair into DNA. That would vastly increase the number of possible codons, in theory giving cells the ability to exploit more than 100 extra amino acids. Although Church still believes that his own approach is more practical for most applications, he describes the new work as a “milestone in exploring the fundamental building blocks of life”. Researchers first imagined an expanded genetic alphabet in the early 1960s. The first big success came in 1989, when a team led by chemist Steven Benner, then at the Swiss Federal Institute of Technology in Zurich, forged DNA molecules containing modified forms of cytosine and guanine2. These “funny” DNA letters, as Benner has called them, could replicate and make RNA and proteins in test-tube reactions. Over the past two decades, Romesberg’s team has made hundreds of even funnier DNA molecules. Unlike conventional base pairs in DNA and those made by Benner’s team — which are bound together by shared hydrogen atoms — these foreign bases stick together because of their insolubility in water, largely mimicking how grease droplets clump in water. To function in living cells, though, the foreign base pairs need to sit alongside natural bases without disturbing the shape of DNA or disrupting essential tasks, such as the processes that faithfully copy DNA and transcribe it into messenger RNA — an intermediary molecule between DNA and proteins. In 2014, Romesberg’s lab reported a breakthrough: a strain of E. coli with a loop of DNA containing a single, unnatural base pair3. The ‘alien DNA’ was made of chemicals called dNaM and d5SICS (dubbed X and Y, respectively). But the cells divided sluggishly, and tended to lose their foreign DNA over time. In a paper published earlier this year4, Romesberg’s team created a healthier, semi-synthetic E. coli that didn’t so readily reject its foreign DNA (in this version, d5SICS was replaced with a similarly shaped chemical called dTPT3). Yet this strain, as did the one reported in 2014, lacked the ability to use its new codons. In the latest research1, reported in Nature on 29 November, the team created healthy cells that can finally wield their foreign DNA. In separate experiments, the cells incorporated two unnatural amino acids (called PrK and pAzF) into a protein that emits a soft, green glow. Both the foreign bases and amino acids were fed to the cells, and any organism that somehow escaped the lab would not be able to produce them. To allow the cells to use these new components, the researchers created modified versions of molecules called tRNAs, which function to read codons and ferry the appropriate amino acids to the cells’ protein factories — ribosomes. The new amino acids did not change the shape or function of the green fluorescent protein. But “now that we can store and retrieve information”, says Romesberg, “let’s do something with it.” In unpublished work, his team has inserted a foreign base pair into a key site in the gene implicated in antibiotic resistance. Bacteria that shed their foreign DNA become sensitive to penicillin-related drugs. 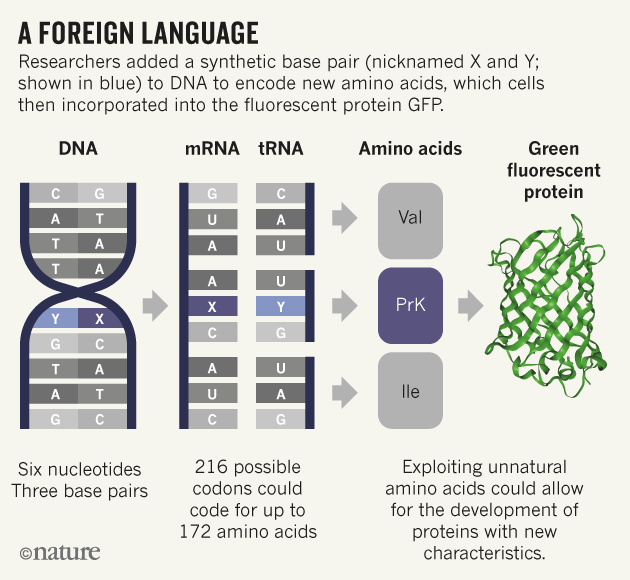 Teams led by Benner and Ichiro Hirao, a biological chemist at the Institute of Bioengineering and Nanotechnology in Singapore, have already developed test-tube systems for using foreign DNA to encode unnatural amino acids. But Hirao sees advantages to moving into living cells. Proteins containing unnatural amino acids could be made at larger scale and more cheaply using bacterial cells, he says. Bringing the technology to eukaryotic cells would allow for the development of new antibody drugs, too. However, Benner, who is now based at the Foundation for Applied Molecular Evolution near Gainesville, Florida, suggests that because Romesberg’s system relies on relatively weak hydrophobic forces to hold foreign base pairs together, its potential for industrial applications might be limited. Cells may tolerate the rare foreign base, Benner says, but “one simply cannot build an entire genetic system from them”. Romesberg and his colleagues are now working on expanding their genetic alphabet further. So far, the team has identified 12 more codons containing X and Y that are functional, says Romesberg, but “there’s a lot yet to do”. There is no strength in shadow. Darkness cannot keep out light. I am shocked to say I would probably be willing to commit a long and disturbing list of crimes in order to live here. Do you remember the last time you did something to make your wife feel special? When you married the woman of your dreams, you not only gained a friend and a lover for life, but a confidante, a helpmate and a caregiver. She is someone you know will steady you when you are faltering and will go all out to cheer you up, when you are feeling low. She is the mother of your kids. So, do something special to make your wife feel glad that she married you. Whether you are a brand new husband eager to make her the happiest bride, or a long-wedded spouse wishing to rediscover the fun-loving girl you married, here are some infallible ways to make your wife happy. Write a romantic letter. Love letters written by hand never go out of fashion. Put your most romantic thoughts on paper, preferably perfumed, and it will surely light up your wife’s eyes. Surprise her with a meal you have cooked. It need not be something elaborate –just a salad, a main course and her favourite dessert should do. But take care to set the table for an intimate dinner, with candles, flowers and soft music. Arrange to go on a luxury cruise. All women love being indulged and what better way to spend a long weekend than go on a luxury cruise in balmy waters and golden sunshine. But make sure that you leave the kids behind, so that your wife can have some time of her own. Invite her family over. Your wife’s parents mean a lot to her, so ask them over for Thanksgiving or any such special occasion. It will assure her that you consider them part of your own family and this will make her really happy for marrying you. Surprise your wife with flowers for no reason. Make her fall in love with you, all over again. Book her a session at a luxurious spa and better still, join her. She will not only enjoy the spa session, but will be happy that you came along with her. Do something she hates. Choose a chore – like taking out the trash or cleaning out the garage – that your wife really dislikes doing and then go on to complete it. Show appreciation for her hobbies. Attend the exhibition where your wife’s craft works are on display, or a flower show where her dahlias have been put up. Your interest in her hobbies will give her a feeling of pride and gladden her heart. Gift her an afternoon at the beauty salon. Offer to take care of the kids and let your wife pamper herself at the salon. She’ll come back glowing not only because of the recent facial, but also out of appreciation at your gesture. A sure shot way to make your wife happy at the end of the day is to pick up her favourite dessert on your way back home. Surprise your wife by dropping in at her office at lunchtime and then take her out for a quick bite. It may not be very romantic, but your wife will love the spontaneity of the gesture and the fact that you took time out from your own schedule for the lunch date. Join a salsa class for couples. Your wife will be glad of the intimacy of the dance and having the chance to do something fun together. Make a bowl of popcorn, when your wife settles down for her favourite TV show or movie. Surprise her with your thoughtfulness. Surprise your wife with a really expensive gift, like a Cartier solitaire or a Gucci handbag. Watch the sparkle in her eyes and hang the expense. Do something fun together. Find out fun ways of spending time together as a family. You could pack a picnic basket and spend a lazy Sunday afternoon at the park, while the kids run about playing games. Recreate your first date. Take your wife out in exactly the same way as you had done on your first date. The romantic gesture will be sure to make her giddy with love and happiness all over again. Put together a gift basket for your wife, with assorted aromatic oils and let her sensuous side feel pampered. Offer to take over, when your wife has to wake up at night to soothe a colicky baby or a sick child. Even if she may not seem grateful at the time, the fact that you have given her a chance to catch up on her sleep will surely gladden her heart the next day. Find out your wife’s favourite perfume and gift it to her for no particular reason. Give your wife a back or neck massage after a particularly gruelling day at work and she is sure to thank her stars that she married you. Ask your wife what she would like to do, before you get ready for an intimate evening. Really pay attention to what your wife has to say, especially when you are in company. This will make her feel respected, even though you may not agree with all her views. Find things to compliment about her. All of us like being praised from time to time, but more so, when the compliment comes from a spouse. However, be genuine in your appreciation, as false praise could make her feel worthless and even hurt her. Take care of your appearance. Nothing turns a woman on as a well-groomed and well dressed man. Become that man and give her one more reason to be glad she married you. Offer to take your wife out for shopping and be honestly interested in what she has to buy. She will be glad that you chose to give your time and effort to her shopping interests. Gift your wife a subscription to her favourite magazine. It’ll make her happy to know that you pay attention to what interests her. Go over old photo albums with your wife one afternoon. It will not only bring back warm memories of you together, but also make her want to relive those happy times. Invite your wife’s best pals over for a meal. Making a genuine attempt to know who her friends are, will make her proud and happy to have you as a husband. Kiss her the first thing in the morning. Women love simple displays of love and waking up your wife with a kiss, is sure to set her humming for the rest of the day. Cheer for your wife’s favourite sports team. So what if your wife is a diehard soccer fan while you can drop everything for a game of baseball. Just this once, switch on to her favourite match on TV or better still, root for her favourite team and watch her beam at you. Put the kids to bed. After a gruelling day at work and home, your wife is bound to be tired up to her eyelids. Even if the same goes for you, go another mile and tuck in the kids to bed. Your wife will surely be grateful for your thoughtfulness. Remind your wife that she is beautiful. As couples settle into a routine of familiarity, they slowly stop appreciating each other. Remind her that she is still the most beautiful woman in the world for you and watch her glow with happiness. Say sorry when you have made a mistake. And mean what you say. Play host to your wife’s boss. If your wife expresses a desire to invite her boss over for dinner at your home, agree to it graciously and be the perfect host. It will mean a lot to your wife and she will be proud to have such a supportive husband. Write a poem for your wife. In these times of electronic modes of communication, a poem that you have composed yourself, will make her feel really special. And be sure to make it as romantic as possible, whether it rhymes or not! Be the one to make the morning coffee. Bringing a steaming cup of coffee to your wife’s bedside on a cold morning, is sure to put her in a happy frame of mind for the rest of the day. Snuggle up to her. Women love the feeling of physical intimacy. Snuggling up to her, now and then, will make her feel desired and happy to be your lover. Surprise your wife with tickets to a romantic movie, especially one that she has been planning to watch for some time. But be sure to accompany her and don’t leave her to go with a friend or co-worker. She will be happy to relive the earlier days of your romance. Hold your wife close at social occasions. This will not only make her feel loved but reassure her that you are proud to have her as your wife. And this in turn will make her feel happy. Make breakfast on weekends and serve it to the kids so that that your wife can sleep till later. Better still, bring it on a tray to your wife in bed and watch her beam with happiness. Treat her like a lady. No woman can resist a man with perfect manners. So even if you have been married for some time now, continue to hold open the door for her and pick up her things if she drops them. She will be glad to know that you are still the gallant young man she fell in love with. Willingly accompany your wife to family events. Granted, that you are bored among all her cousins, aunts and uncles. But make a sincere attempt to look happy at a family wedding and your wife will be sure to appreciate the gesture. Send your wife a bunch of flowers at work and sign off as a mystery lover. Chances are that she will correctly guess you have sent it, but she will love the drama of it all. Call your wife once in a while. Say that you were missing her and just wanted to hear her voice. This will assure her that she figures in your thoughts even while you are busy, and make her really happy. Leave a love-you note on the bathroom mirror. Better still, make it funny so that it leaves a smile on her lips for the rest of the day. Don’t offer a solution, immediately after your wife mentions a problem. 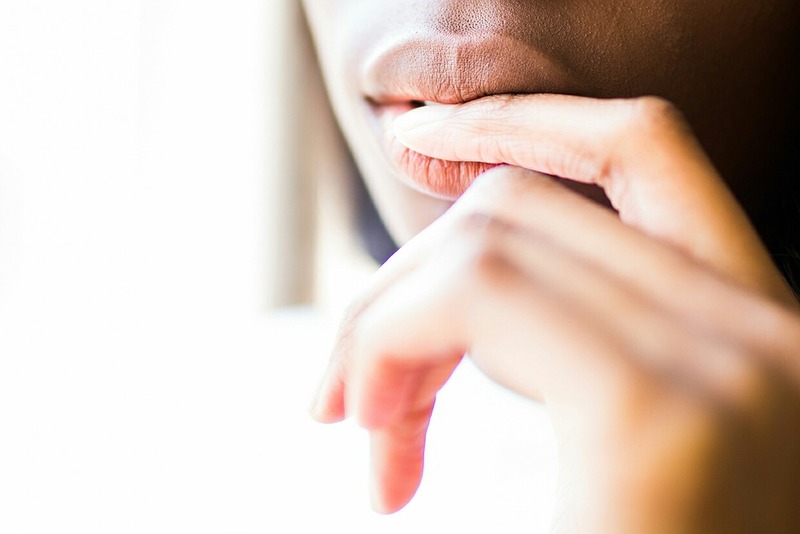 Women often tend to voice problems as a way of discussing things and most likely, they are aware of the solutions themselves. So simply listen to what she has to say and offer a solution only when asked. She will be glad of having a good listener. Flirt with your wife now and then. Go back to the old days when you flirted with each other shamelessly. This will not only spice up your marriage, but also make your wife feel desired and happy. Be punctual. Just because you are married now, does not mean that you can keep your wife waiting for a meeting. Continue to be punctual as you were when you were dating each other and she will be glad of your responsible personality. Don’t forget to take out the trash and any such chore that you both have decided is your responsibility. Let your wife know that you have been reading up on ways to make her happy. It may seem to amuse her, but actually she will be pleased to know that you are interested in making her happy. Finally, remember to put the toilet seat down. Nothing will make her happier than to have a man around who follows this cardinal bathroom rule. Every woman likes to be pampered now and then. While gifts and vacations are infallible but extravagant ways of making your wife happy, remember that there are many simpler ways of putting the sparkle back in your woman’s eyes. All it takes is a bit of generosity and a truly loving heart to make her feel glad that she is your wife.